Definitely the best call - you've achieved perfection with it so the only direction now has to be a new adventure! You were doing your suspension refresh at a similar time to me (I remember your bling uprights) nearly 4 years ago. I must admit I love driving/owning mine and really isn't anything else out there in comparison, although if I went into as much detail as you have I would probably want it sitting in my front living room! Wow! who put it on YouTube? 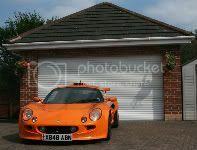 sorry to hear that you are selling your Exige. I had the hope that our Chrome Orange twins will meet one day. I do enjoy a nice project just like you do. Fortunately my Exige is in a much worse condition than yours and so I'm still able to fully enjoy it which I do. The Exige S1 is such a special car. I drove 500 wonderful miles during the summer, it's so nimble and not once did I go to the limiter during run in but I was sooooo tempted. I will miss it in a MASSIVE way but it really is way too special to use as much as I'd like. That said every journey into my garage is an epic one, you could literally eat your dinner off any part of it. If I do still have my Exige next spring/summer, it won't be a burden and I will likely Armourfend the front and sills and take it out now and then on that special day. Unless some one offers you a big wedge of cash, why not keep it until the next exiges.com trackday so you can give us all the chance to drool over it? I expect it works as well as any other S1, even though it has been removed.